Melissa Summers | One cannot experience a triumphant celebration when there is no mountain to summit. Wow, time is flying! The walk was a few weeks ago, I cannot believe that it has been that long already. Like every year, the sky was dark and gloomy..I honestly think it is a tradition. With husband in the car and dog on the leash getting ready to load up, thunder and lightening greeted us a “Good Morning”. Now dog was not so sure about that greeting! But with all the training and socialization that I have been doing with her, I really wanted her on this walk. So we drove through the rain to the walk site…walked through the pouring rain to the registration building..sigh..at that point I wasn’t sure if I was going to walk in that kind of weather. But by the time registration was done, my team gathered, dog wrangled, and ribbon cutting ceremony done, the skies cleared out for our walk. We even had a few patches of sunshine to light our way. While there were many in attendance at the walk, it was certain that the weather had kept quite a few at home. I am proud to say that my brace worked wonderfully! I had no problems at all walking the 3 miles….first time in 2 years without my cane!! Special thanks to my family and my co-workers that joined me on that somewhat dreary day to walk and supprt the cause! Cheers! Since my last neuro appointment, I had been anxiously awaiting the arrival of my new AFO brace to aid my walking ability. The first step was to have an appointment at a medical supply supply facility that provides orthotics. Luckily there was such a place just down the road from where I work. At the appointment my gait was observed..I always have trouble having my “natural gait” show when I know that people are watching me walk. Then I was place in a cast from my toes to my knee, the cast would be used to mold my brace. Once the cast was cured and removed I was told the brace would be in and ready in about two weeks. Two weeks.. I have been so spoiled by working in the medical field that I am not used to waiting for things! Two weeks pass by and then I recieve the call that the brace is ready for me to be fitted. I am more than ready as my ankle just aches from struggling with the weakness. The brace is a hinged brace to allow my foot to flex upwards but prevents it from pointing down towards the floor. The bottom section starts off thin from just below my toes, the brace thickens as it covers and cups my heel. The leg section runs from my ankle and up the back of my calf almost to the back of my knee. Just below my knee at the top of the brace there is one velco strap. The hinges connecting the two pieces lies at my ankle joint. At the fitting the girl explained that I needed to pay attention to where the brace may be rubbing, andn to discontinue use if anything gets painful or if any blisters develop. Because my ankles are very bony and prominant, I may have difficulty with it rubbing on them. I was instructed to wear the brace just for a few hours, increasing the time each day. I headed back to work with the brace in place. It didn’t take long before it had to be removed! My work shoes were not designed for a brace..my foot felt crammed and my toes were going asleep. I traded my work shoes for my regular shoes which was a better fit but I still was not comfortable. The next day I braced myself up to test it out on a walk with the dog. It was during a short walk that I realized this was not going to work for me. My ankle felt as if it was trying to escape from the brace and was rubbing viciously on the brace joints. My heel was shifting around in the heel “cup” like I had on loose shoes. An adjustment was in order. So on Monday I headed back to the medical company. I felt like there was going to be nothing they could do to make this comfortable for me. The brace was uncomfortable, painful and clumsy. They fitted it up with a thicker brace padding ove the hinges and placed it back on my leg. It still shifted on my heel some, but I was willing to give that change a try. To my surprise, I was able to finish out the work day without having to remove the brace, the new padding worked! With the brace on and as I became familiar with how it felt, I noticed my gait was becoming smoother. I did not have to lean to my left to give my right foot clearance of the floor to take a step. In fact, I do not even think that I had a limp or a staggering step. For the first time in two years….walking almost felt easy and normal. So the excitment has returned. The MS walk is in May, and this may the first year since I lost my right leg two years ago that I will not be using my cane! After using the brace now for a few days after the adjustment, I am now able to wear it for the duration of my work day. Honestly, it is hard on my foot as there is no cushion, but my gait is almost perfect. Here is the brace closed, my foot is unable to flex down towards the floor. Here is how the brace looks when I take a step forward. My ankle is allowed to bend in the direction needed to walk. Sometimes it is unbelievable at how fast time flies. It has been one year since my last relapse and the start of this blog. I originally began the blog to help myself track the progress as I recovered from my relapse. After all when something is abruptly taken from you without warning, the shock of that reality can be overwhelming. The first time I lost use of a leg, in 2007, fear and frustration set in immediately once my limitations were realized. It took not only steroids but an extensive round of physical therapy to slowly bring back my ability. My only regret on that relapse was I had no documentation, visual or written, to refer back on when I felt like I was not making any progress. So, last year when the same thing occured on the left side, I began this blog for my own personal reasons. Once I had it posted, I decided that the blog would be a useful tool in communicating to my family my well-being, accomplishments..or lack of gain. Then as I faced the frustrations of dealing with MS, I felt that others faced with this disease should be aware that they are not alone. It is not uncommon to feel frustration and grief. Not every story has a happily ever after. Life is not as it once was…it’s different. Yet, different is not bad. I see things and appreciate things in a new way. Simple accomplishments are often celebrated…or I should say, once simple tasks are often celebrated. A few years ago, if someone told me that in the near future that I would celebrate the fact that I finished a 3 mile walk without collapsing, I may have laughed as I was an avid walker. I have pushed my limitations beyond their limits. I have learned that determination has a longer definition than what the dictionary states. Today, I received my AFO, a brace fro my right foot and ankle. Once I get some pictures, I’ll tell my story on dealing with this new and exciting part of my adventure! On Wednesday I had a visit to my neurologist that was moved up a few weeks because of the trouble I had been having with my feet and ankles. The last few weeks it has felt as though I have been walking around on ice skates with no ice. My ankles feel very tired and weak. And of course, once anything in my lower extremities feels weak, my balance gets unstable. The good news is that I am not in the midst of a relapse, so no steroids. The other good news is that I will be fitted this week for an AFO, a brace to keep my foot from dangling when I raise it to take a step. While some may not consider a brace “good news”, I see it as a tool to help me stay moving. Hopefully the AFO will help keep me from tripping on my own feet, make climbing steps less tricky and also will help my energy levels as it will be less work to walk as my gait is affected by my misbehaving ankles. Basically, I am excited about my fitting on Friday…I am hoping though that I will not have to get new shoes to fit around the brace, mine are only a few weeks old and I am not one for shopping! Time is flying, and preparations for the National Multiple Sclerosis Society Michigan walk are underway! Right now I have been getting my webpage ready for the walk and soon will be looking for team members to join me on the 3 mile trek on May 9, 2009. It’s exciting as not only does this raise money for research and education but for myself it is a personal challenge as I have some mobilty issues. My mobilty isssues are very minor right now but I am very cautious as I approach this time of year since this is the season that I have had relapses the last 2 years. My right foot has been giving me some trouble..I am in contact with my neurologist currently to see if this is something that needs looked at in detail. Cross your fingers! Some take the mark of the New Year to use as a fresh slate for a new beginning with an organized list of resolutions. As for myself, organization is not a word in my vocabulary. Life changes too quickly and easily to make any dramatic changes or plans. For the most part I live one day at a time, giving my attention to what needs attending, either body or spirit. This trait is also what has kept me “sane” during all the inconsistencies that MS throws around. Of course MS is not the only things throwing things around..last week a wind storm decided that our front tree would look much better laying down in the drive on top of our two cars. Thankfully, the tree was removed, we had use of a generator ( Thanks Mom & Dad) for the 3 days without power and we have a loaner car to get us through until our vehicles are fixed. Life is well. No, I didn’t plan on having such a minor disaster, but everything works out in the end regardless of whenever the end may occur. Even disasters can provide lessons that are important in life. After all, one needs not to wait for the next New Years to start anew…a fresh start is just a moment away, ready or not! With the holiday season rapidly arriving, Michigan received a gift of snow storms, high winds, ice and below average temperatures over the last few days. The bitter cold has been rough, not only increasing my spastic muscles but also has been affecting the circulation in my fingers. A recent visit to my regular doctor confirmed that my circulation losses are from Reynauds syndrome. The main reason that I went to the doctor’s was that I had been experiencing a 3 week long headache. Turns out that my muscles were so spastic that it had been giving me a tension headache! The other day it was a brisk 16 degrees out my door. The wind was taking the already knee deep snow and tossing it into drifting banks. My house was warm and cozy..and then the new pup needed to go outside for a potty break! Since we are in the midst of housebreaking, any hints of a full puppy bladder are not ignored! Armed with full winter gear, I trudged through the snow suddenly realizing that there are benefits to this winter weather. My midcalf boots provide a brace type effect, preventing foot drop. The deep snow becomes my resistance trainer for leg strength and also provides a soft landing when I trip or lose my balance. Plus the more I move around, the better it is for helping my spasticity. There is also no greater motivation than watching my dogs wagging their tails inviting me to play in the snow. Each year as the temperatures get lower, my spasticity increases. Most commonly my legs are affected, but when it is cold the back of my arms and my stomach also start contracting. Overall, my legs have been very well with coordination and even strength. Stairs give me minor troubles, but as long as I am careful, they are not an obstacle. When I did have problems with steps and getting off the floor, one of my dogs was always there for me to hold on to and steady myself. Last week, I lost that beautiful helper of mine. He was more than a helper. He was always there for me, during floor exercise time, walking exercise time, and during my sitting down and crying my eyes out times when frustration took over..he was there for me to hold. During his last month, I held him, cheered him on and helped him..just as he had supported me in the past. That circle was now complete and it was his time to move on. He had shown me the meaning of devotion. And I was able to show him that I learned that lesson as I held him during his passing. I was blessed that he shared the last seven years of his time here in our home. The lessons and memories that he has left us with are numerous and precious. 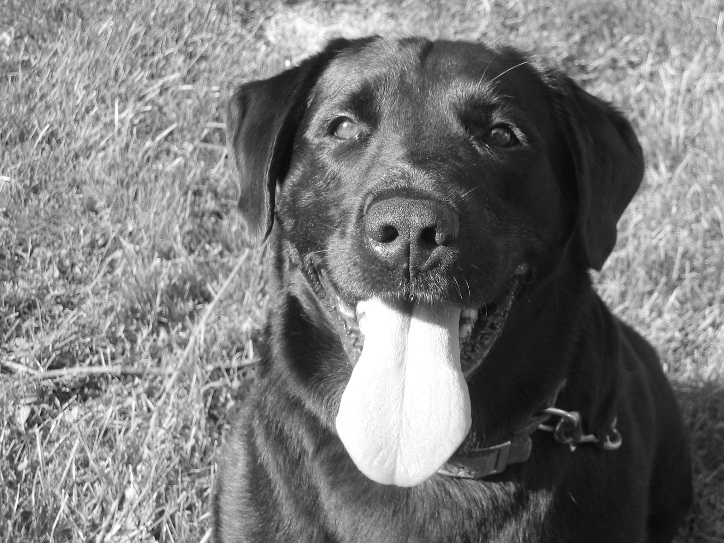 Peaceful journey Joker…you will be missed. Since my relapse in February, I have seen my neurologist every 4 months to monitor my recovery. During my visit we discuss my progress on any medication changes. After my last appointment, the dose on my anti-spasticity medication was decreased due to magnified existing fatigue and unbelievable brain fog! As silly as it sounds, I literally was sleeping on my feet. While everyone smiles at a small child that has fallen asleep in the midst of a meal, it’s really not as cute when you’re 35! Although I am still having spsticity problems, the changed dosage is the best balance at this moment in time. Next, a few simple muscle resistance exercises on each of my arms and legs to see where any weak areas or motor skill dysfunctions may be occurring. These are just simply a “push and pull” against the neurologist’s hand. Finally my gait is observed. I find it difficult to show how I walk “normally” while crossing a small exam room, very aware that my steps are carefully watched. I still have occasional foot drop on the right side. Good news is my left leg which was affected by the most recent relapse has very little difficulty! Finally the words I have been waiting for…. Yeah! A 6 month recheck is my usual, normal, routine visit! Now the question is…does this qualify me as usual and normal? Today was the perfect day for a birthday, the kind of day that many born in January fantasize about. The sun was shining, a perfect 71 degrees and not a snowflake in sight! Of course, nothing against my “day” in January, for it marks the origin of my start in this life. Today is another birthday, not an anniversary, holiday or festive occasion created to provide greeting card creators a reason to generate income. Today was the day that I administered to myself interferon shot number 52. The interferon that I take to help combat Multiple Sclerosis is one that is injected once a week. Since there are 52 weeks in a year….that equals ONE YEAR OF INTERFERON THERAPY! Honestly, I never dreamed that I would make this milestone. It has been a year of doubts, fears and weaknesses. Interferon therapy is not fun, it’s hard on the body, and it makes me ill for the 24 hours following my shot. There had been more than one occasion in which I seriously considered going off the medication. Thankfully, deep logical thinking and reviews of the medication studies kept me on track. I do find it odd, the feeling of celebration that is surging through my body. Is it possible for me to celebrate a medication that makes every inch of my body ache? Celebrate waking up at 2am with chills so severe, that my teeth are chattering hard enough to make my jaw hurt? Celebrate that every Friday night I get to sink a needle almost 2 inches in length deep into my leg, knowing that it will bring on these side effects? Today I celebrate that I was strong enough to continue the interferon therapy. I celebrate that although I had a disease relapse that took my left leg, the strength and control in that leg quickly returned. I celebrate that I have a wonderful and knowledgeable health care team. Finally, I celebrate that I am doing everything that I can possibly do to keep this disease from progressing. The blues. In the music world, it is a genre that encompasses deep emotions, deep rhythm and deep sounds. Despite the pessimistic channels, “the blues” has the power to lift the spirit, the heart and also the physical body. I dare anyone to listen to the beat of the blues and to try to keep their feet from tapping! In multiple sclerosis, “the blues” take on an entire different tune. The National Multiple Sclerosis Society has mentioned that studies have suggested that clinical depression, the severest form of depression, is more frequent among people with MS than it is in the general population or in persons with other chronic, disabling conditions. During my own minor roller coaster fluctuations, I spent some time looking through the numerous studies to find out how to battle this facet of MS. Just as there are many theories on the cause of MS, there are also many theories and variables that make depression a common “symptom” of MS.
First, there are medications used to combat the effects of multiple sclerosis. Personally, I am on 4 main medications, 2 of which list depression as the most frequent side effect. Next, there is the physical limitations. A day fighting to keep moving and battling fatigue is exhausting. Once again, personally speaking I find that when physically drained, I am also emotionally drained. My temper becomes short and cognitive skills diminish. I call it my child without a nap syndrome. Another quite reasonable possible is the disease itself. Emotions are created in the brain, the brain is composed of nerves coated in myelin which is damaged from the disease. A simple explanation on this process can be found on my 3-8-08 Multiple Sclerosis thread. Once the emotion areas are damaged, it damages the way they are processed and the ability with how to express them becomes diminished or even overactive. Finally, there are some that manifest depression as a result of the inability to cope with a disease that is so unpredictable. With MS there is no knowing what each day will bring, or take away. My thoughts on this portion are that even healthy people do not know their own future, lives can be changed in an instant. Dwelling on such thoughts produces nothing but more negativity. There are medications available to assist those with this symptom. It is recommended that anyone with depression spanning longer than 2 weeks should seek medical assistance. For myself, my ups and downs are part of routine life. I believe in balance, everything evens out. I try to live and look at things realistically. If I am feeling down, I ask myself a few questions. Am I safe from harm at the moment? Have my nutritional bodily needs been met? Do I have a home to protect me from the outside elements? These questions cover the basic needs, once answered I am assured that I should be comfortable, safe and can relax from any fears created by my mind. A friend of mine has a wonderful saying “Live in the now”. Those questions enable me to do just that. Often I “arm” myself with education. By learning about my disease I am able to not be caught by surprise. I am able to eliminate any fears of the unknown, preventing my imagination from getting the best of me. Emotional fluctuations are common in everyday life. I also know that if I ever need assistance , my medical team, family and my knowledge of what the processes and symptoms are, are immediately available. For the record dear family and friends, I have life’s basic needs, and I am safe from harm, comfortably “Living in the Now”, and enjoying listening to the blues! As with many others with MS, I have muscle spasticity. Spasticity is a tightening or contraction of a muscle or group of muscles. I experience this daily in both of my legs, occasionally the back of my arms and once in a while my stomach. Imagine that you are on an exercise regimen, fulfilling a late New Years Resolution or just trying to get in shape. A balanced exercise plan usually includes some weight workouts to gain muscle tone. So out come the weights…don’t forget to dust them off! As you start to lift the weights..one..two..hey, pretty easy. Seven……oh boy, can I do eight? The muscles are tiring, the body begins to struggle to maintain the motions that were once easy. At this point a burn begins and there comes a point in which you will not be able to lift that weigh for another repetition. So, if you are like many others, the weight goes back into the closet to gather dust, and you rest your muscles. With spasticity, the muscle contracts as if holding a weight and then holds it’s position. A burn begins and the muscle becomes fatigued. Movement becomes not as fluid and is sometimes shaky as the muscle struggles to work. There is no weight to put down to relax the muscle. It will quit when it is ready..or not at all. When I was first experiencing spasticity, I honestly did have fantasies of a super toned body without the workout! Buns and Abs of Steel tapes? Not this girl!! Needless to say, yes, I am toned..but will definitely not be entering any body building contests! There are a few medications out there to help combat spasticity. Unfortunately they also have side effects, the most common being drowsiness and fatigue-both symptoms that are already present in those with MS. While I am on a medication to help ease my muscles, it is not as effective as my body would like it to be, and my body cannot handle a higher dose. When I am very tight, the quickest cure is a nice warm bath. Now, the fun part. Heat aggravates MS symptoms!! It is 85 degrees outside, I am stiff and sore, longing for a hot bath, but I am so heat sensitive! Any MSers out there with that have a hot tub? Truly, I am curious as if I make that investment, if I am careful with the temperature settings if that may work to help. I am sure that it will definitely be of benefit once the weather cools down. P.S. Wow, over 500 hits on this blog…people are actually reading this? With the temperatures climbing above 90, I fantasize about climbing inside my refrigerator. Hey, my little man that takes care of the light has been on vacation for the last month, which leaves room for me! While heat can drain most people, those that have MS are very sensitive to the warmth. Any symptoms that had been present, are worsened or magnified when the body temperature rises. July weather, baths and even a fever can cause this to happen. Long before diagnostic technologic advances were around, MS was diagnosed by placing a person in a warm bath to see if symptoms would increase. Honestly, sounds more comfortable than being crammed into the shaft of the MRI tunnel! While the heat can raise the feelings of weakness, being removed from the heat source will let the symptoms recede. So to combat the heat I have in my arsenal the following: Several cooling scarves in which absorb and retain cool water for a couple of hours (think running around in a wet swimsuit feeling), Cooling sandals that are kept in the fridge until ready to wear. As nice as these sandals sounded, they only stay cool for about 30 minutes. I also have a pillow cover that can be soaked in cool water and should work similar to my scarves. As for how well the pillow cover works, it is new and I have yet to try it. There are also vests available to keep MSers cool during the summer. Some contain cool ice packs and other more advanced models actually pump and circulate cold water through channels in the vest. These vests are more expensive than the items I already own, however if my heat sensitivity ever increases, I definitely will look into getting one. Then again…Dad, you have an extra pond water pump? After cleaning a few corners of the house, we decided that the holiday weekend would be perfect for a yard sale. We live just off a main road, perfect to snag those traveling North for a long weekend getaway. Such work! Early start, late close..but between our sale and our neighbor across the street, we managed to block traffic on the road often. Joker decided that the front yard is his haven. Even though he escapes the backyard and roams whenever the oppertunity arises, he is a perfect gentlemen in the front yard. He made sure all visitors were welcomed and would follow closely anyone that briefly touched him..one would think he has been ignored his entire life! With the sale proceeds, it was time to upgrade my dilapitated shed in the backyard. 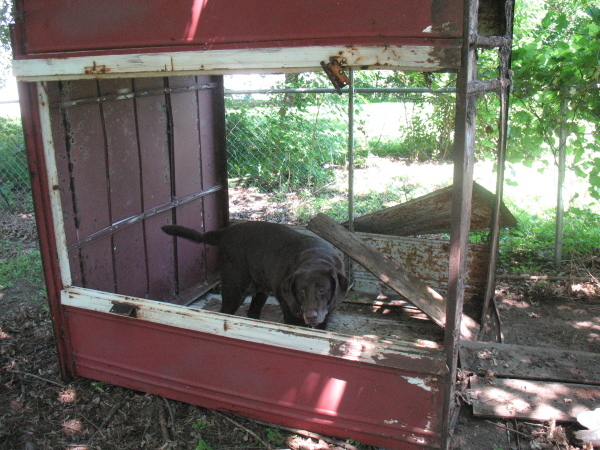 I found a great deal on a metal shed, but first the old one needed demolished! What fun! So Harley and I set out to acclompish the demolition duty! So now I have a demolished shed and the new one is yet to be erected! Another Wednesday “rest day”. My apologies on lack of updates recently! As the weather warms, things get busy..I know I am not alone on that scenario. Multiple Sclerosis affects many different parts of the body, physically and mentally. Losing cognitive skills is a very common symptom or side effect of the disease. I have found in the last year that multi-tasking is a bit more difficult and learning new things does not come as easy as it has in the past. However, age is also a culprit. Yet, my next visit to my specialist, I would like to bring up this concern. A couple of weeks ago, after arriving at work, I had the feeling that my right leg was longer than the left. My foot placement felt odd and my gait was off. Now of course with MS, odd feelings and symptoms are “normal”, so I plodded onward. Since I felt like my foot was not stepping down where it should, I glanced down to see where my left foot was landing when I took a step. 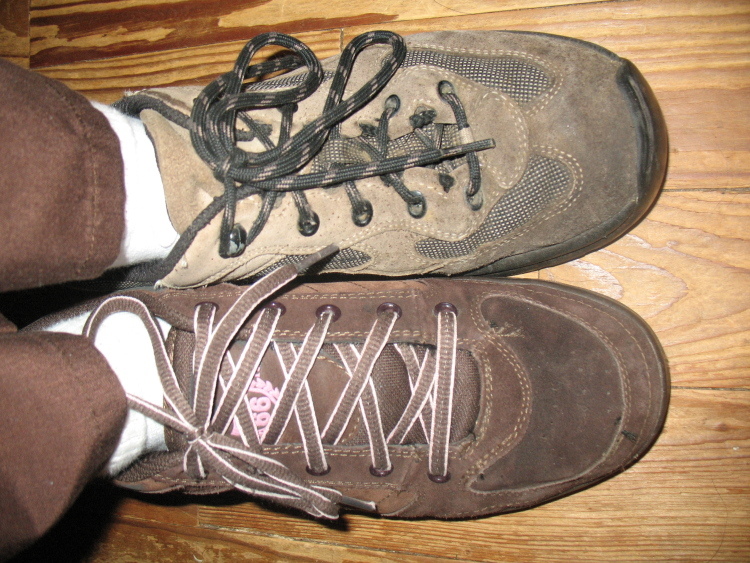 To my surprise and horror…I was wearing TWO DIFFERENT SHOES!! In my own defense, they were both brown and I had the right shoe on the right foot, the left shoe on the left foot…that should count for something correct? So what’s a girl with two different shoes to do? This girl laughed, laughed hard and long, and then showed off my “pedi-creativity” to my co-workers. It took me all day, but I did it. It’s been a long time since it’s been done by yours truly, but …. I began this task..umm not a task.. I began this event at 9 am this morning and finally finished at 8:37 this evening. Hello, Guiness book of records, how do I apply? Now, just to clarify, it did not really truly take me almost twelve hours, I had to take many many breaks! It was about 4 separate “sessions” to complete. I haven’t mowed the lawn in almost 2 years. It has always been one of the more enjoyable chores to take on. So why on earth would I do such a crazy thing on my “day off for rest in the middle of the week” ? We had to buy a new mower..and I simply wanted to see if I could get it started. Now of course once it’s running , and with gas prices as high as they are, might as well make a few rows in the yard. The new mower is much more difficult to manuever in my opinion. However, my opinion may not count for much as I am no longer an expert at lawn care! Four rows and my body decided that it had enough. Later I took the dogs out and looked at the goofy stripes in the lawn. Now who can leave stripes in their lawn? If it is possible, I could have left them! Guess what? I had to add a few more stripes so the first ones wouldn’t look so lonely. As the day progressed, the stripes began to outnumber the unruly lawn. Finally, this evening in the cool air, I started the mower back up again to finish the last 4 rows. The smell of fresh cut greens filled the yard, and a sense of victory began to arise at the idea that I was almost done. Wheeling the heavy mower back to it’s home in the garage, I turned to my dogs with a smile. “Did you see? I asked them excitedly “Did you see what I just did! 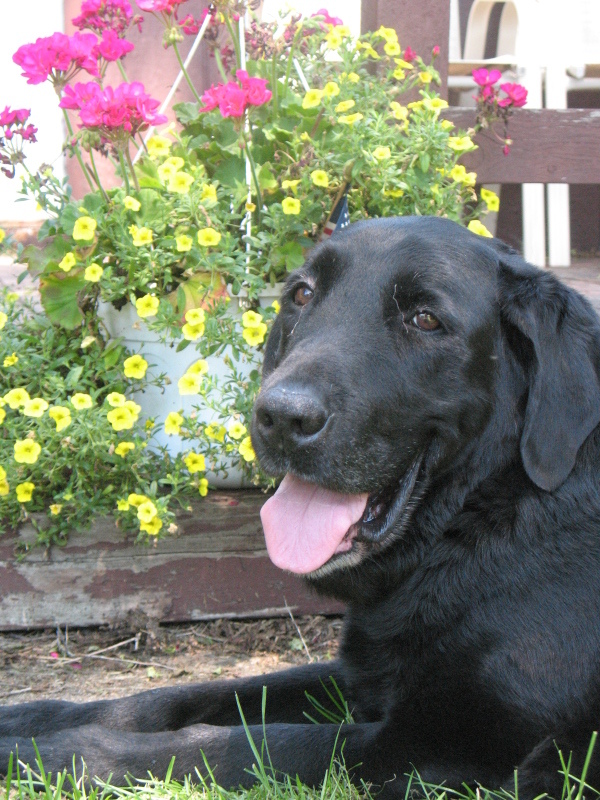 I did it all by myself!” Joker, my usually mellow black lab, jumped and cheered along with me. “Good job Mom!” Harley, my chocolate lab who always had agreed with me in the past, just rolled his eyes. I stuck my tongue out at him and then the three of us shuffled through the fallen grass clippings to head inside, all exhausted from our adventure out of doors. After moving from the city quite some time ago, I quickly learned that country life was not as secluded as it initially appeared. 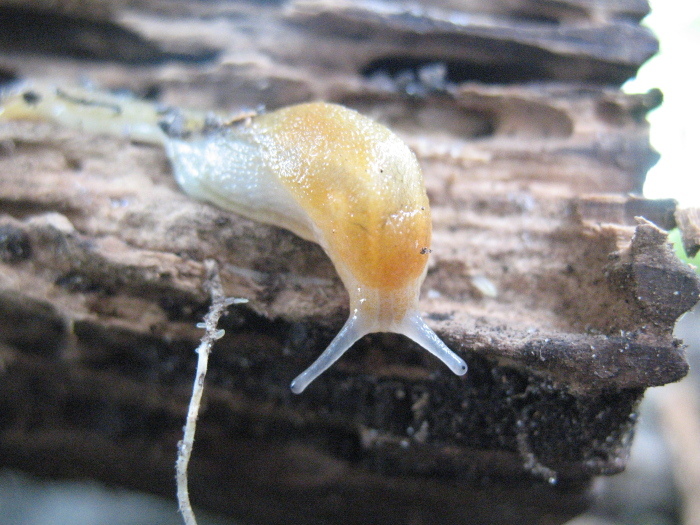 The neighborhood is filled with a variety of folk of the natural sort. It has been a learning experience for me as I have in the past, found uninvited creatures in my home, and had to quickly learn to watch for wildlife not obeying traffic signs or rules of the road. Earlier this week I had a close call during my morning commute with a rather large, rather ugly and rather ungainly wild turkey. My past experiences with turkeys have been fairly consistent..I drive down the road, look off into the fields and see a few turkeys loitering on occasion. So, I was a little slow to identify the dark lumbering, flapping shape that was quickly but awkwardly advancing into the road. Time slowed to a crawl as my brain raced to solve the mathematical equation: If a Pontiac Vibe at Point A is traveling east at 55 mph, and a turkey at Point B is traveling southwest at a surprisingly quick pace, will they collide at Point C? Yes! Arrghh! Time resumed it’s natural speed..in fact it may have sped up a notch! The turkey cumbersomely waved it’s wings in the air attempting to raise it’s bulk from the earth. Amazingly to me, the bird began to gain loft. I say this is amazing, because I guess i didn’t know that turkeys could fly. Now to call this process a graceful one would be quite false. He tottered in air, flopped , legs flailing behind. Luckily, his altitude was just enough to clear the hood of my car, leaving just his knobby legs to drag across the windshield. In the end the turkey successfully crossed the road, the car suffered no indentations and I was left a bit in awe over the fact that turkeys fly..well..um fly awkwardly. I have had many close encounters of the wildlife kind. It has been a few days and the turkey event has stayed in the forefront of my mind. There is a reason that I experienced this particular event, a lesson was to be learned somewhere. I thought long and hard over this story and then I came to this conclusion. This turkey had a difficult time taking flight, he did not give up trying, he gave that action 100 percent of his ability. I realize that no matter how ungainly, awkward, ungraceful or lumbering one feels that if you set your mind to accomplish something anything can be achieved. Of course, yes this bird had a reason of self preservation to give him a boost..but lets just ignore that fact for now! Turkey vs. Vibe = Turkey Vibe. My new saying for when I feel as if my accomplishments are a touch out of reach..and it’s just silly enough for me not to forget! I am very lucky that I was diagnosed in this decade. There are many that did not have the benefit of having interferon therapy available to slow down the disease progression. Interferons do not cure MS, they slow down the disease process, help the nerves heal better after a relapse , however they do not work for everyone. When dealing with interferons, one must get over any needle phobia. For myself, I had no trouble with the fact that I had to inject myself, what I do have trouble with is that the interferons make me ill. One of the most common side effects is flu-like symptoms which ease up over time. Flu like symptoms was a major understatement the first month I began injecting myself! I was very ill with fever, tremors and nausea. Now, seven months later, I still get ill on occasion with a fever. So, here I am on a spring Saturday morning, my neck, elbows, hips and ankles aching from a mild fever. I don’t like it. I don’t have to like it. So many personal MS stories that I have read early on in the disease were so optimistic, how bright and cheery life can be with this disease. The negatives are frosted over in these tales with chocolate icing, hiding the fact that there is no sugar in the cake. I am not saying that life cannot be bright and cheery by no means, I am saying that it is perfectly normal to have moments where you can be free to say “I don’t like this!” and “No cake for me, thank you”. I know how important a tool interferons are to fight this disease. I realize that my injections played a major role in my fast recovery on my last relapse. I harbor no ill feelings towards them..I share my life with them..make accomodating adjustments like a perfect hostess…and it’s okay that I just don’t like it. This years walk was simply amazing. It is difficult to find the words to properly explain the emotions, the atmosphere and even the physical portion of the walk. The small town of Frankenmuth was crowded by those that came to walk, volunteer and support the efforts against Multiple Sclerosis. The walkers were many and varied. There were those that walked fast, some took a pleasant stroll, some had wheelchairs or scooters, and there were some that walked those 3 miles with the supporting arms of friends and family keeping them on their feet. There are days on this earth when we ALL feel tired, feel like we might collapse if we take another step. There are times when we feel that we are physically unable to accomplish something due to limitations. No one is immune from these feeling regardless of health or physical status. But, the mind and the heart are powerful forces, nothing is impossible. Need proof? Attend one of these events. Watch the heart take control of the body. Watch those that can barely stand pass under the finish line balloon arch. Watch their eyes. Were they letting their body tell them that was an impossible feat? Now this years walk, just as the year before took place 2 months after I had lost use of a leg. So yes, the walk for me has been a challenge…not sure if that is the correct word to use. Let’s just say the walk is my way of telling my body, who is in charge. So not only am I raising money to further research and help fund education, but this event also has helped raise spirits and faith within me. This year, I was accompanied by an official team! Now not only did I physically have five individuals with me on that overcast spring day, but I had an uncountable number of those that were with me in heart, mind and spirit. For everyone involved, I thank you all dearly. I also have a very special thank you to my virtual but very real friends. For those that spend most of their time on the material “real life” plane, I would like to introduce to you my virtual friends. On an online community that replicates real life, but with fun added extras like flying, I work with a large group of amazingly talented and generous musicians. Routinely, they perform concerts from their home, stream it online into a virtual world. Now some of these musicians played in a nine hour benefit to raise funds for my walk. And raise funds they did! The total donations reached almost 300 dollars. Below is a picture of myself standing next to my virtual self “Summer” in the green dress. Around me are a few the the wonderful musicians from various parts of the world that donated their time and talent to raise funds for my walk. Thank you First Call Musicians Cooperative, for your generosity and support in the past year. On February 22, 2008, I lost use of my left leg. On April 28, 2008, my left leg is officially stronger than my right leg! While climbing the stairs at work, no toes had gotten hung up on the stair treads and no delay on foot placement. However, later in the day I noticed that it was a bit harder to lift my weight up when stepping up with my right leg. Less than one week until the walk..walk it? Hmmm I may run it! Well…in my dreams, never was a runner! Honestly I am quite shy about asking for money donations, even though the charity is for such an important cause. Why? I wish I knew that answer. I am impressed by those that have no fear. Soni, my co-worker has that trait that amazes me. Upon joining my team for the National Multiple Sclerosis Society and printing off the pledge forms, she disappeared. Ten minutes later, she returned asking for another form, as hers was all filled up! About six forms and two days later she has collected numerous pledges! On another fundraising note. 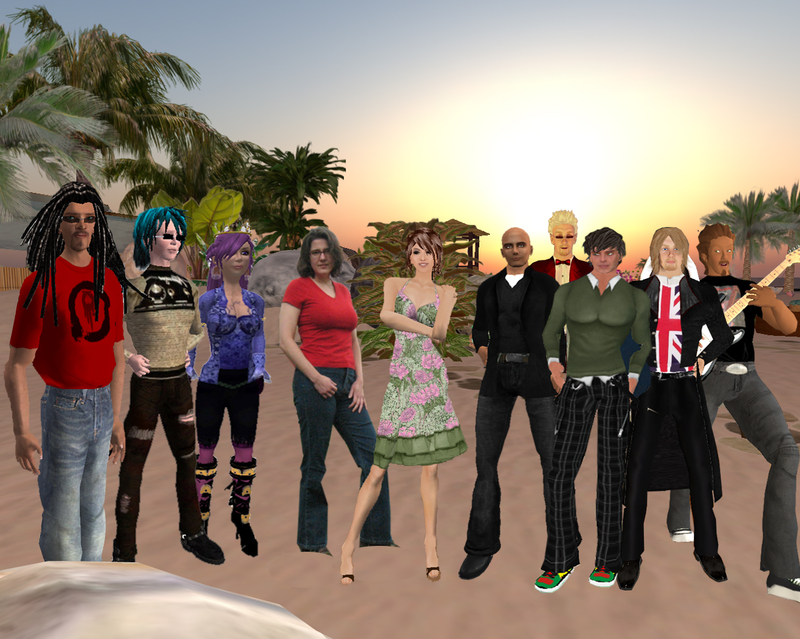 I belong to an online virtual community..another world. In this world, I work with musicians that perform live concerts. Some of these generous musicians donated their time to perform a live 9 hour benefit concert for my charity walk. Not only was the fact that they donated thier time and talent touch me, but the end total donations of almost 300 dollars sent me into tears. How to say thank you to all of these amazing people? Words seem weak and useless. It is hard for me to find how to express the magnitude of my gratitude. But for now, to my friends- THANK YOU! I am just astonounded at the rate of recovery on strength and control in my leg. Maybe these interferons that make me so ill are of benefit after all! Late last week, when no one was looking, I went up the stairs two at a time..slow and holding on to the rail. No difficulties! Now of course, this was in the morning as afternoons are an entirely different story! On Saturday, I decided to paint my kitchen. The paint has been sitting in my spare room for a couple of months now. I wear my procrastinator title proudly! My initial goal was to get the edges and corners cut, as I know how fast my energy can leave my body. Well, that looked odd, and I still had strength, so I continued on my task. Now, one cannot go through a day without learning something new…or so my mother has always said. I now have the pleasure of saying that I learned that if ones balance is a bit screwy..one leaves handprints on freshly wet painted walls! I have invented an entire new faux painted look! Home improvement buffs, let the jealousy begin!!! Only two more weeks unitl the walk!! I cannot wait! I have been taking short strolls during my lunch break and taking the stairs whenever my balance allows. shh..don’t tell my co-workers..I did the steps today two at a time!! I am simply amazed at how fast the control is returning. Anyway, back to the walk..2 weeks from Saturday! What? It’s on a Saturday? The day after my shot day? Oh no! Anyone have an extension cord long enough to cover the 3 miles so I can stay snuggled up in my electric blanket while I have the fever chills? Ha! Here’s hoping for one of these nice warm days we’ve been having lately! Warm and sunny, cold and chilly..I’ll be there! Over 200 hits on this website..I must admit , I am amazed at that number! While there is no cure for MS, there are medications that can help slow the disease process. These medications are called interferons. The fun part of interferons is that you get to play with needles! WooHoo! Oh the fun things one can do with sharp needles, like jab them in your thigh, or sink them into your hip, ready to sign up for this exciting experience yet? What interferons do is help lesson the chances of having a relapse (having a nerve get damaged and shut down-remember the mouse and the wiring?) Relapses can still happen, as I have recently discovered while on the medication. But the medication can help by having less damaging relapses and quicker recovery times. Another fact that I am personally discovering as my leg is getting better day by day! The interferons are not without side effects, the most common being flu like symptoms. For me, this was an understatement the first month. After my first injection , my fever was so bad my entire body shook, my jaw and teeth ached from chattering and I made many trips to the restroom to relieve my poor stomach. Now these symptoms ease up over time, and I now only run a fever-sometimes “violent” and sleepless, and sometimes just a low grade fever with body aches for the day afterwards. I take my injections on Fridays, giving myself Saturdays to regain my strength and rest my body..Saturday plans are usually very mellow, but isn’t that how Saturdays should be? Now I have to admit, there was a point in time that I seriously considered to stop the injections. I had my reasons, and to me they were logical. Thankfully, I had a friend that convinced me the shots were necessary, and thankfully I seen the logic in that. Thank you Duck, for making me realize the entire picture of that decision. Now I am grateful for that advice and thankful that I continued the injections. If I had quit taking them, I would have blamed this relapse on the fact that I wasn’t on anything to prevent it, and my recovery on this relapse may have been an entirely different experience. The annual National Multiple Sclerosis Society MS Walk in Frankenmuth is less than ONE MONTH away!! Are YOU ready to walk? Come on folks, it’s only 3 miles…just a short stroll…weather of course is unpredictable but the atmosphere is always SUNNY!! Just click over to the Frankenmuth Walk located just right of here under pages. This year is very important to me, first it is the first year that I have created a team for my walk. Second, this month is my 5 year anniversary of learning about myself at a level I never would have discovered had I not been diagnosed with MS. I have learned that life is special. 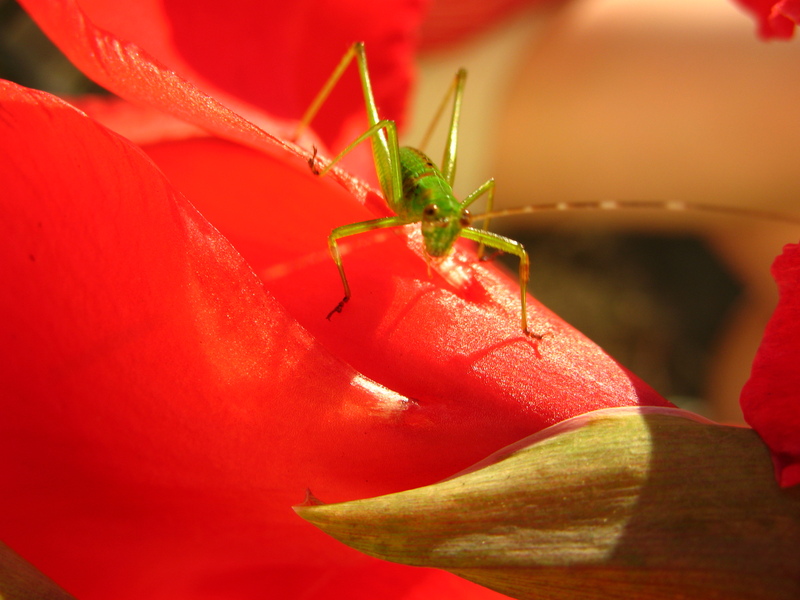 “Stop to smell the roses” is easy to say, but when your internal spedometer is stuck in1st gear, you not only smell the roses but absorb the fragrance, see the light reflect on the velvet petals and hear the footsteps of the baby grasshopper exploring a whole new world. I have learned that strength is not just a physical thing, but an emotional entity also. Through this I have discovered that strength is infinite, regardless of how weak the body or the soul may seem, STRENGTH HAS NO BOUNDRIES! And that phrase will be my motto this year. I designed a logo for this year that includes that motto, so any ideas on what we can do with that graphic, I am open to ideas! Rough day at work, was very busy in the morning and my stamina just is nonexistant at times. Once I reach the point of fatigue, my legs tend to go into spasms. I still used the stairs…legs are not allowed a vacation! My toes would sometimes catch the edge of the steps, but I take care and time climbing them, I need to get those muscles built back up again. Good news, it was Tuesday, and I have Wednesday off to rest! Now this Wednesday thing..it is neccessary, a tool, and I really have mixed feelings about it. I long for the relaxing, but am frustrated my the limitations. I want to be home..but do not want to be home. It is best that I don’t think too hard on that matter! It has helped on my fatigue and getting through the work week. Now MS fatigue, is unique. For myself, it feels like in my thinking processes, that I have not had sleep in a few days, things are foggy and thoughts are slow to process. Physically, the best way to describe it is the feeling you have when leaving the water, and experiencing the weight of gravity after swimming for a long peroid of time. The heaviness of the limbs and the weight of the body seem to drag and protest at leaving that weightlessness feeling of being suspended in water. My balance is affected, and my legs do not always go exactly where I tell them to move. I seen a tshirt slogan:” I used to be nice to look at, but with MS now I am fun to watch!” This is truly a perfect phrase! This week I have gone up and down a flight of stairs a few times! How to explain…the feeling of joy, the feeling of accomplishment, just THE feeling. Yes, my life exists without using stairs, but darn it, that sure made me happy. I didn’t miss not using the stairs, but that feat left me with an aura, or bubble of happiness surrounding my person. Of course, the day after first walking the stairs I had a terrible day with my balance! Weebles wobble but they dont fall down was my slogan that day. I really know inside that those days I should be using my cane. I keep one in my car, so that there is always one handy wherever I may roam. But, once again, is it pride, or convenience that just makes using a cane at work difficult for me? I have no troubles using it when I am in a store. I know it is a tool to fight the changes and allow me to maintain myself, yet there is that little part of me that sees it as a reflection of my disability. But overall, there is physical proof of me regaining my strength! Yes, to all that have that question in your heads: I DO NOT play on the stairs on the days that my balance is off! My brain has not had that much damage to it! Today was the day for my one month follow up visit. For some reason I was a bit anxious about this visit today, not nervous, just ready for this appointment. Now my appointment was scheduled for the afternoon, which of course means a nice long wait in the appropriately named “Waiting Room”. Now, the seasoned “waiter” that I am, I nestled down into a seat with my book. In the seat across from me, was a gentleman, dressed in worn clothing. His ragged coattails brushed the floor, and his patched trousers were a bit large for his modest frame. Curiousity now brought my attention from the pages of my book to the aura surrounding this being nearby. He spoke of being a plasterer and how that occupation is in decline. He shared his story on how lucky he was during his health problems. He spoke with a smile in his voice and cheer in his spirit, that was infectious to all. This fellow didn’t need need his white painted smile to show his happiness in life, when his name was called, he rose with a spring in his step, and Chuckles the clown headed off for his appointment. Another 15 minutes was my turn. Basically, my strength is returning. Yes, it will take some time. But healing is present. There is still delay in reponse from when I tell my leg to “MOVE”. And pivoting on that leg still is not graceful by any means. Of course, I have never , ever been graceful!! I have started working on my gait on the treadmill this morning, something that I really can only do when I have some stamina. Good news is no medication changes are neccessary, something that I had wanted. So, providing that nothing happens in the near future, I do not have to return to my neurologist until June!